I also have the 3 amigos but i is my understanding that the hand brake light is not linked to them so I am at a loss to work out why the light is on. Help please! I replaced my rear ABS sensors with front ones as the rears are too short with a 2" lift. This is common practice apparently but sadly I got cheap ones and they seem to not be up to the task. They have the correct resistance (~1kOhm) and generate some voltage when the hub is rotated by hand but but my local independent has plugged her in and says the signal is too weak. So, as I need a new rear hub (leaking) I thought I'd get a front hub (interchangeable with rears) which will come with the ABS sensor. My question is, where is the sweet spot price wise as they go from £40 to silly genuine parts prices! Lastly, I have fitted the 300TDi diff lock linkage but the diff lock light does not come on. I haven't cut the wire in the SLABS. Should I do this? Will this have a bearing (sorry) on the 3 amigos? Ashcroft's site seems to recommend doing it so perhaps that is tomorrow's task. Thanks for reading this far, hopefully you guys can help as I am at the bottom of my 3rd beer and still haven't cheered up! your second questions answers the first. the three amigos are probably caused by the abs sensors. 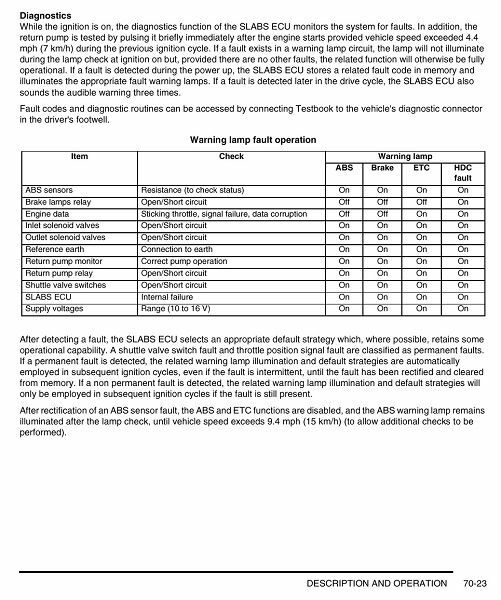 I know the 3 amigos is the abs sensors thanks.😊 But I think they are not related to the handbrake warning lamp unless I can be educated otherwise? @sierrafery - that is some fantastic information thank you! So fixing the sensors should clear all 4 lights... fingers crossed! Spooky! That is exactly the price point my indy recommended (supposedly "OEM") and I have one on order from him! I had the 3 amigos for ages on my D2 and they suddenly packed up and departed when I fitted a new battery and had to make up new cables with decent clamps to replace the dodgy stuff that was fitted. A guy I know also had the 3 Amigos and they were repaired with cleaned up earth points on the block and chassis.